This chapter introduces the philosophical foundations on which the work presented in this book is based. It starts with tracing the roots of Schumpeter’s famous concept of ‘Creative Destruction’, to the image of the ‘Dancing Shiva’ (Nataraj) (a prominent God in Eastern mythology, a symbol of destruction, transformation and evolution) through the writings of several European scholars, philosophers and economists. 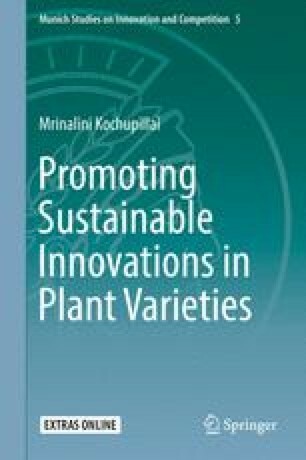 Thereafter, the chapter highlights the similarities and differences between the original imagery of Nataraj and the ‘sustainable evolution’ that it symbolizes, and the Schumpeterian concept of ‘creative destruction.’ The chapter further explains how ‘creative destruction,’ especially in the context of plant variety innovations as seen in the present day plant breeding industry, is not sustainable and why a shift back to the model of sustainable evolution is necessary. The online version of this chapter (doi: 10.1007/978-3-662-52796-2_1) contains supplementary material, which is available to authorized users.